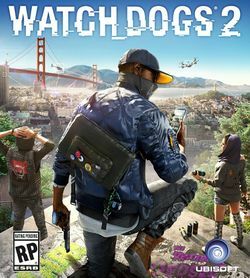 Watch Dogs 2 (stylized as WATCH_DOGS 2) is an open world action-adventure game developed by Ubisoft Montreal and published by Ubisoft. It was released worldwide in November, 2016 on Windows, PlayStation 4, and Xbox One. The game is set in San Francisco, California, and follows the exploits of the hacker collective DedSec as they expose corporate corruption and oppose the proliferation of "ctOS 2.0", the successor to the centralized operating system from the first game. As in the first game, the open world design lets players freely roam San Francisco. The game is played from a third-person perspective and its world is navigated on-foot or by vehicle. Players control DedSec operative Marcus Holloway, an expert hacker who has two robotic drones he can use in various hacking operations. Players can also play online in multiplayer cooperative missions, competitive "vs." operations, 2-vs-2 battles, and racing with various vehicles. This page was last edited on 24 April 2017, at 07:47.